Saturday’s Commonwealth Oaks and bevy of supporting Virginia-bred stakes were everything the Virginia Equine Alliance (VEA) could have hoped for. 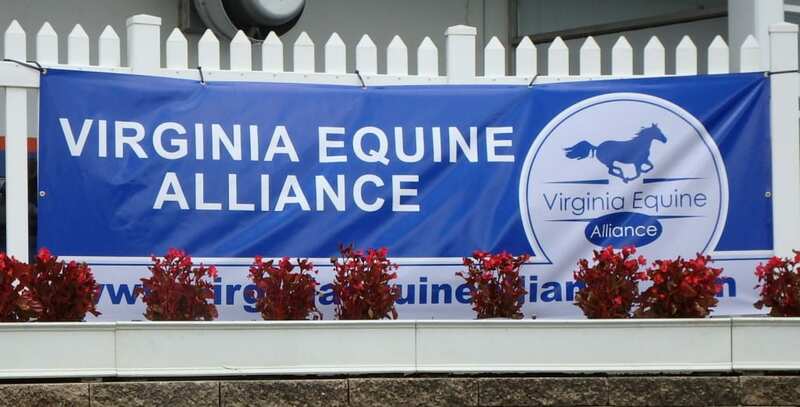 “I think we couldn’t have asked it to work out any better,” said Debbie Easter, head of the Virginia Thoroughbred Association (VTA) and president of the Equine Alliance. “Today is even an improvement over last year, which I thought was a success. The races were competitive and produced a healthy mix of favorites and non-favorites. Two three-year-old fillies — Exaggerated, who won the Oakley in a time even faster than that recorded by the boys in the next race, and Onus, who notched a flashy four-length score in the Grade 3 Commonwealth Oaks — stamped themselves as potential rising stars. Why, there was even some Kentucky Derby-winning racing royalty in the house. Roy and Gretchen Jackson, whose Lael Stables owned the ill-fated 2006 Derby hero Barbaro, were on hand to see Exaggerated’s facile victory; and Stuart Janney, III, co-owner of 2013 Derby champ Orb, watched as his Onus romped home. For all the success of Virginia’s Maryland-based racing last year and this year, the exact meaning of what Petramalo called “a stopgap, interim measure” remains unclear– not unlike Virginia’s future in racing itself. 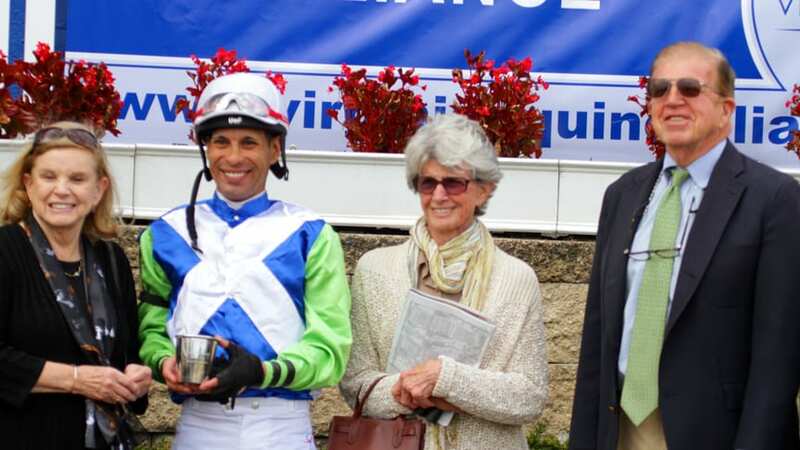 Roy and Gretchen Jackson (far right, second from right), joined jockey Daniel Centeno in the winner’s circle after Exaggerated won the Oakley. Photo by Laurie Asseo. “I think given the climate for racing in Virginia right now, this day here is the best thing the Virginia Equine Alliance can do,” said trainer Ferris Allen. 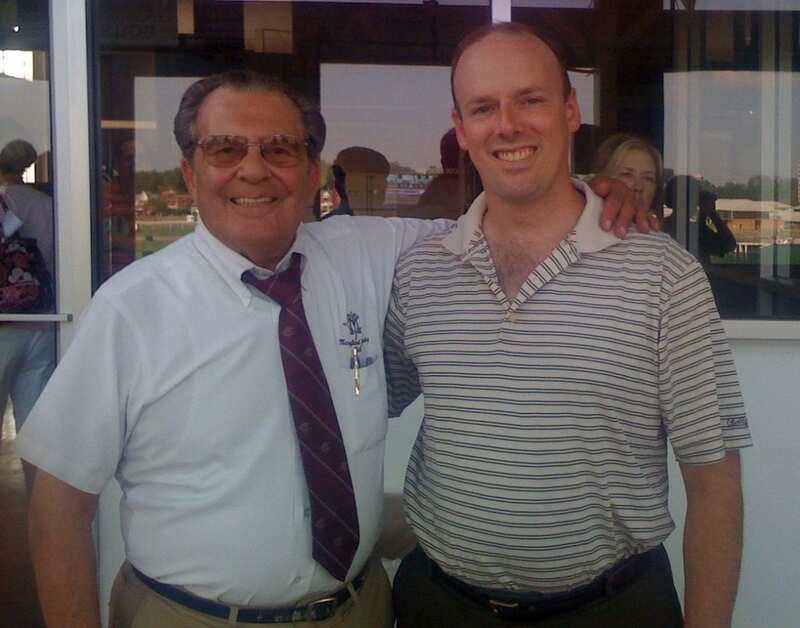 Allen, a native of Varina, VA, and the all-time leading trainer at Virginia’s Colonial Downs, was on hand to present the trophy to the winners of the Bert Allen Stakes, named for his father. For Robin Richards, a breeder and horsewoman from Clarke County, as well as a board member of the HBPA and former president of the national HBPA, the day was more than that. “It was an opportunity — I didn’t run very well — to run a filly in a stake race, which is all important to me,” she said. Her horse, For Finery, finished ninth, though beaten just seven lengths, in the Brookmeade Stakes. The day provided Virginia breeders and horsemen a chance to earn money and black-type — two commodities that keep the industry’s doors open and lights on. What’s more, by running the three graded races — the Oaks on Saturday and the Grade 2 Commonwealth Derby and Commonwealth Cup the preceding week — the VEA retained their graded status, which will in coming years help to attract better horses. To where remains the question. While Jeff Jacobs’ Colonial Downs has been the Commonwealth’s flat track since 1997 — and most horse interests would like to see it remain a key player in the state’s Thoroughbred industry — it seems unlikely that will be the case. Multiple sources have described those negotiations as having something of a “Charlie Brown kicking the football” quality, with Jacobs playing the role of Lucy. 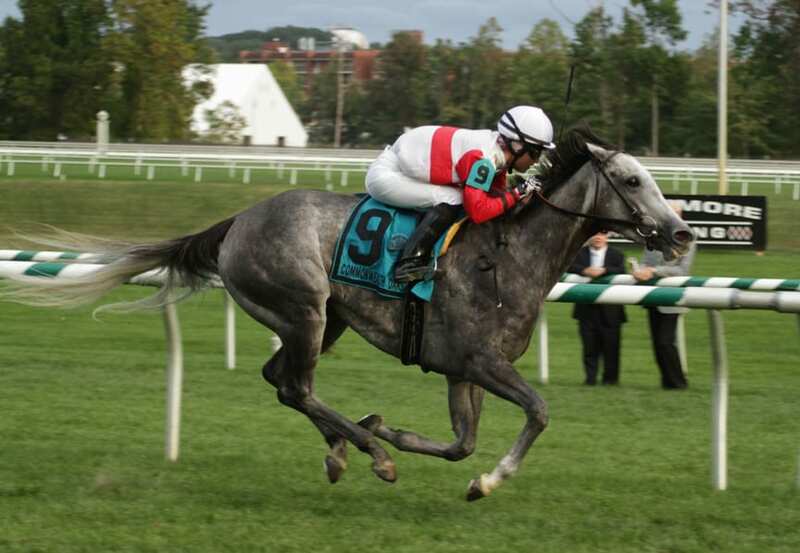 Onus was all by her lonesome in winning the G3 Commonwealth Oaks Saturday at Laurel Park. Photo by Laurie Asseo. Their “back to the future” approach is to bring European-style country racing to Virginia, with short meets held at current or former steeplechase venues under the “Virginia Downs” moniker. Just about a week ago, on September 20, the group held its first full Virginia Downs experience, at Great Meadow, home of the Gold Cup. The six-race card attracted a crowd sources estimated at 2,500, drawn more by the promise of an enjoyable railside tailgating experience and the chance to help out the local SPCA — the day’s charity partner, which took home admissions fees of $30 per car — than any interest in wagering. Total handle on the card, which was not simulcast to other sources and had a limited wagering menu, was just $13,130, according to the official chart. That’s fine, Virginians say, because Virginia’s racing product — whether with Colonial Downs or now, seemingly, without — has never been built on big handle on the local product. Petramalo estimated that those imports had generated “eight or nine million dollars” in prior years for the purse account. With Colonial’s OTB network now shuttered, and the horsemen legally prohibited, for the time being, from opening OTBs, that number is now reduced but is expected to grow once again once those legal issues are resolved. The new model the VEA is pursuing, then, focuses not on handle but instead on attracting crowds to a day of racing in the country and disseminating money to Virginia horsemen and breeders. Great Meadow figures to remain a part of that circuit. Ideally, Morven Park, near Leesburg, will become one, as well. Other sites have also been discussed. “Having been to a lot of racetracks across the country and seen them struggling, I’m really a believer that to have vitality, you have to have these little pockets of interest all across the country,” Richards explained. “What we’re doing is coming up with a new racing model that, I think, is more fan-friendly,” added Petramalo. Yet if the fans loved the experience, horsemen — at least those based at traditional racetracks — may not be so enthralled. And it’s unclear whether top horsemen would send their best horses — three Grade 1 winners competed in the VEA’s graded races at Laurel — to a Virginia Downs event. She said that she had heard concerns about the temporary stalls at Great Meadow and also about the flag starts; there is no starting gate there, and some horsemen have privately said that they would not race at a venue without a starting gate. These are issues Easter said should be rectified if the VEA is able to race at Morven Park. Whether that will assuage horsemen, however, remains to be seen. But Petramalo said he was optimistic. He, and others, pointed to the recent success of Kentucky Downs, a European-style turf course that recently concluded its five-day meet with nearly $17 million in total handle. Yet that track offered purses for maiden races of $120,000 — the most by far of any track in the nation and an amount fueled in large part by slot machine-like instant racing machines. Virginia, with little possibility of alternative gaming, isn’t likely to offer purses remotely approaching that. Richards, who said of the country racing plan, “You work with what you have,” added the day’s coda and perhaps pointed to what might be Virginia’s greatest asset. Frank Vespe, the founder of The Racing Biz, has owned, bought, sold, claimed, and written about horses, in varying combinations, for a decade. All you have to do is read the many quotes from this article to understand why many serious horseplayers in Virginia are left scratching their heads and looking for sanctuary elsewhere when it comes to serious horse racing and wagering. The so-called new model of horse racing the VEA wants is described as one that does not focus on handle but instead on attracting crowds to a day of racing in the country and disseminating money to Virginia horsemen and breeders. The new-model is said to be more fan friendly. Say what? Don’t you just love hearing comments fairy-tale like comments from the VEA on how fans just “loved the racing at Great Meadow. I’ve never had so many compliments from the fans.” Comments such as that means acceptance of statewide dog and pony shows only for the self-gratification of the horsemen. Just get me my picture in the winner’s circle with my 10k claimer and I’ll be a happy camper for life. These people could care less about the re-opening of the OTBs, which is what horseplayers want first and foremost. The best comment was from the horse person who said “We’re a stubborn bunch.” Unfortunately, this is the future of horse racing in Virginia! Fan – thanks for checking in. In fairness to the folks from the VEA, they are eager to get OTBs open and running again (they have every reason to be!). But they’re prohibited by the law from doing so at this time; Colonial retains that right for the time being. The biz…..Thank you for the response! The reason why horseplayers have been so adamant about allowing Jacobs to do his thing and re-open the OTBs is because he at least has the money to do so. In fairness to all of us, the VEA needs to admit to everyone that they plain and simple do not have any money. They want to control everything that pertains to horse racing in Virginia, but they have no resources. Lets face it, the majority of the otb’s will never reopen! The Martinsville otb has been sold to a church. The building has been gutted and all the equipment sold off. If Martinsville is never reopening why would one believe the otb’s in places like Vinton, Scott county and Alberta are going to reopen when they didn’t do as much business. I will NEVER make a bet over a computer. Have long since realized that I will be driving to Charlston WV from now on if I want to play the horses.